AdUnity introduces a GDPR readiness programme to help marketing departments prepare for GDPR and build trust at scale. The programme is designed to help consumer brands become leaders in trust and engagement. Our GDPR Marketing Operations Readiness programme is not just about how to avoid fines and reputational damage: it is an opportunity to experiment and learn how to build trust at scale in the specific context of your marketing operations. Now is a very exciting time for innovation in marketing. GDPR raises the bar in terms of what is expected of marketers and makes the handling of PII a key differentiator between brands. Increased public understanding of their rights will inevitably mean increased consumer expectations. Leading brands will take this as an opportunity to build competitive advantage for the future. The aim of our GDPR Marketing Operations Readiness Programme is to help brands gain this competitive advantage by building trust, increasing flow of consent, and reducing friction with customer interactions. Post-GDPR marketing is a complex matrix of rights, rules, and risk mitigation combined with traditional marketing operations. Implementation of scaleable consents, marketing audit trails and Consent-Based Advertising requires internal orientation and mapping multi-dimensional business, process and compliance requirements to a final production ready system that can scale. It is now clear that in the vast majority of cases consent will be needed for the processing of PII for marketing purposes. However, this is only the beginning of the journey. Once consent is understood as the legal justification for processing for marketing many questions then arise about: what PII really needs to be collected; how and when consent is captured; how does the consent relate to other legal justifications for processing; what is the assurance level of the consent; what is the purpose of the consent (which must be clearly defined); what is the data retention period of PII; and so on. It is how these questions are answered that will make the difference between building and destroying trust. The best and most effective answers to these questions will vary from brand to brand and market to market. It is certainly not a one-size-fits-all. The best answers will be found through experimentation. Trust is key to brand success and thanks to GDPR it will be measured in consent. However, for effective interoperability, this must be combined with open international standards. Our iterative approach to service design is combined with compliance to recognised international standards. At AdUnity we use the privacy and identity management standards as defined by the Kantara Initiative and used worldwide in many sectors, such as eGovernment, financial services and healthcare. The Kantara Initiative drafts specifications and recommendations for standards bodies and industry use. Kantara maintains relationships with Organization for the Advancement of Structured Information Standards (OASIS), Internet Engineering Task Force (IETF), International Organization for Standardization (ISO), ITU-T and IDESG which is further supported by the ISO, ITU and IEEE. Unlike other GDPR consultancy services, AdUnity focuses on providing practical demonstrations of what GDPR would look like in the setting of each brand’s marketing objectives. We do not start with a long audit that is intended to clock up unnecessary consulting hours. Instead, we hold combined workshops with the marketing team, DPO, in-house lawyer, and other team members to rapidly build working demos to quickly get to the point of what works and what doesn’t. In the initial workshops, we take a real but scaled-down advertising goal. We call this a minimum viable advertising goal, e.g. retargeting from brand site. We then co-create a demo of that the operational outcome of that goal within the context of the GDPR risks, rules, rights and safeguards. 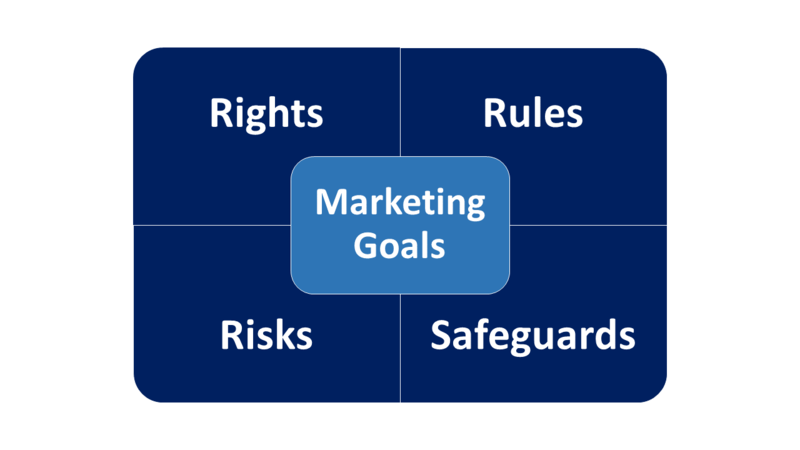 These risks, rules, rights and safeguards are structured into our Marketing Goals Alignment Matrix to better enable understanding of what GDPR really entails. The result is that the relevant stakeholders within the business (e.g. marketing department, DPO, C-suite and legal) get to see what is really involved in being GDPR compliant. We answer the basic questions: what does consent capture really mean; what kind of PII do we really need; how do we specify purpose; how does this relate to other operations; how long do we really need to hold PII, and so on. This spurs learning, cooperation and innovation within the business. This is demonstrated across different functions within the business to aid learning and to flag changes and potential conflicts in processes. This process is repeated once or twice more until the brand has an initial strategy about how it can use GDPR to become a leader in trust and engagement and how it needs to be compliant. At this point, we are ready to run a test campaign to test assumptions and provide a benchmark against legacy operations. Brands have a choice, they can see GDPR as a compliance problem or a trust and engagement opportunity. Sign up here to learn more about our GDPR Marketing Operations Readiness Programme so that your business becomes a leader in trust and engagement.